Established in 1993, Gearhead® is a heady mix of high octane punk 'n' roll, vintage pop culture and the grease of American car kulture all rolled into a unique brand of clothing, music and media. Gearhead® Productions, Inc. is a California S Corporation, owned and operated by Rev. 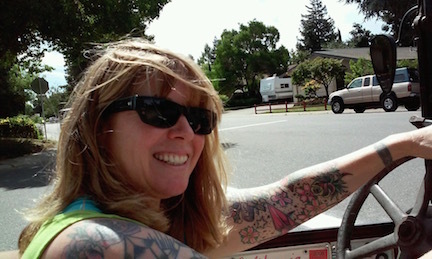 Michelle Haunold and guided by a board of directors who oversee the entire Gearhead® brand. The company manages the federally registered trademark, copyrights, and licensing for all the Gearhead® products including a clothing line, a record label, a magazine and other printed matter. Gearhead is recognized internationally as the place to go if you dig rock and roll and kustom kulture! Gearhead® started as a magazine in 1993, the brainchild of former owner Mike LaVella. The magazine was inspired by the culture around hot rods, custom cars and rock n’ roll. It was an immediate success and the worldwide demand led to the creation of the clothing line shortly after the launch of the magazine. In 2000, the brand expanded to include the record label when Rev. Michelle came on board as co-owner. Having met when both were writers for the critically acclaimed punk magazine Maximum Rock ‘n’ Roll, the two worked together to release over sixty records as well as a expand the line of clothing and accessories and the continuation of the magazine. Internationally recognized, the distinct logo and products associated with the brand have been sold to over 50 counties. Gearhead® products and music have been featured in major motion pictures, national radio shows, TV shows, advertisements and national magazines, including multiple MTV productions, West Coast Chopper motorcycle events, Rockstar and Sega video games, online videos for Airwalk, Vans and Roxy and magazines including Rolling Stone, Spin, Newsweek, Women’s Wear Daily and Alternative Press. LaVella moved on to other projects in 2013 and Haunold took sole ownership of the company. After a five-year hiatus riding out the waves of the financial crisis, she relaunched the company piece by piece, starting first with a new record from The Lords of Altamont in 2014, followed by new t shirt designs and finally, at the end of 2015 releasing the long-awaited issue No. 19 of Gearhead Magazine. 2016 will see a further expansion of all three components of the Gearhead brand, with more new records, clothing and another new issue of the magazine. The Gearhead® brand continues to grow and change, pulling design elements and inspiration from the past but barreling down the road towards the future. Fasten your seat belts folks, you're always in for a ride when you get on board with Gearhead!